R&R Insurance has proudly su pported the United Way for many years. 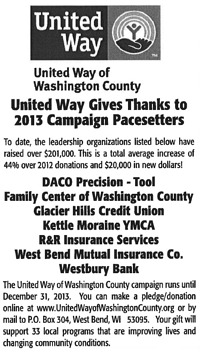 Our West Bend office is one of seven Washington County organizations recognized as pacesetters. Collectively those seven organizations have raised over $201,000 in 2013! The ad on the right was in the West Bend Daily News. R&R West Bend has raised money through various activities such as a candy fundraiser, Ugly Christmas Sweater contest, hosting 3 office lunches, and basket raffles to name a few. One of this year's highlights was participating in the United Way's Kickoff Campaign where 61,048 macaroni meals were packaged by 528 volunteers ... in 1.5 hours! This was enough to help 6 food pantries in Washington County! The Washington County United Way County campaign runs until December 31, 2013. Click here to make a donationto help support 33 local programs improving lives and changing community conditions.